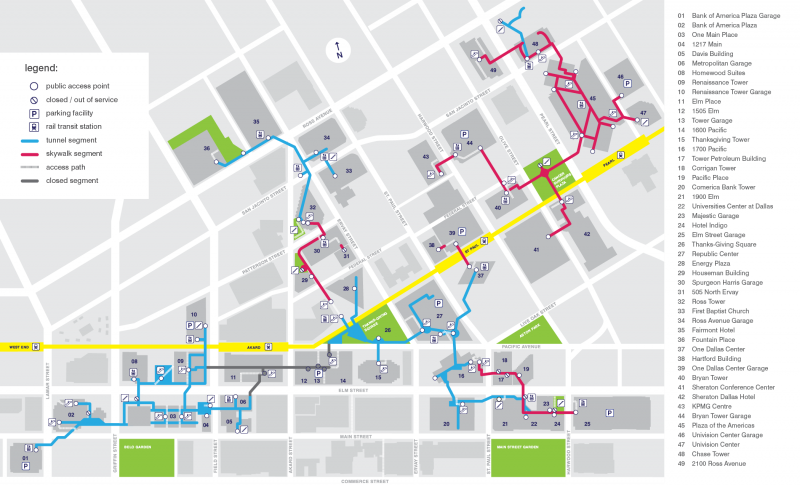 The Dallas Pedestrian Network is a collection of tunnel and skywalk segments connecting professional offices, hotels, residences and attractions in the heart of downtown Dallas (across 36 city blocks). Referred to locally as the “tunnels,” the system was built organically over several decades, and is privately operated with a small portion owned by the City of Dallas. In 2011 designer Noah Jeppson researched and designed an updated map showing all existing pedestrian routes. This map highlighted access routes to street-level destinations and public transit. After an initial printing of 10,000, these maps were distributed to area businesses and information centers, available for free thanks to the donation of various sponsors. The map was updated in 2015 with updated routes and access points. View the map below or click here to download the full PDF of the Dallas Pedestrian Network Map (updated 01/2015). Printed maps can be found at visitor information centers and businesses in downtown Dallas. To license or sponsor a special printing of the map please contact Noah Jeppson. Dallas Pedestrian Network Map by Noah Jeppson is licensed under a Creative Commons Attribution-NonCommercial-ShareAlike 4.0 International License. This website is maintained for public reference by Noah Jeppson and is not affiliated with the City of Dallas, any properties/businesses or sponsors listed on the Dallas Pedestrian Network Map. Due to the changing nature of an urban environment indicated routes, access points and businesses listed on the map may no longer be accurate. Unless otherwise indicated, all images and content on this website are copyright Noah Jeppson.